William Dummer (1677 - 1761) served as Governor of Massachusetts from 1722 to 1728, and again for a few months in 1730. He married Catherine Dudley, a daughter of Governor Joseph Dudley but they didn't have any children. When he died he left his mansion and 300 acre farm at Byfield to endow "a free grammar school" in Byfield parish, in the town of Newbury. 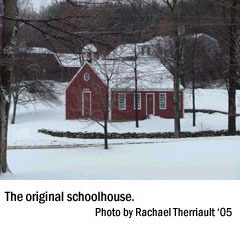 This was the earliest academy in New England, and was opened on 27 February 27, 1763, with twenty-eight pupils. Until the early 21st century, it was known as "Governor Dummer Academy" at which time the name was changed to "The Governor's Academy". Please be sure to visit the official website of The Governor's Academy. The following account is from Edwin Elbridge Salisbury, Family Memorials, New Haven, Connecticut, 1885, pages 258 - 260, 272 - 275. For the complete account including footnotes, please see the original. “Had there been any practicable reconciliation into a harmony of working in the relations between Massachusetts and the royal authority claimed over her, it might have seemed that William Dummer, acting as Governor for nearly six years, was peculiarly suited to serve as mediator, umpire and arbiter. A native of the province, with strong family ties and friendships binding him here, he had lived much abroad, and had become enlarged and generous in his views. He was not a strong partisan, nor did he lack a generous patriotism.” . . . He married Catharine daughter of Gov. Joseph Dudley — a sister of Rebecca who married Samuel the eldest son of Chief Justice Sewall — April 20, 1714; and died Oct. 10, 1761, in his eighty-fourth year, leaving no children. He was a patron of learning in his life-time; and left by his Will £50. for the purchase of books for Harvard College Library, which is commemorated by the inscription of his name, together with others, on one of the library-alcoves. One of the men of distinction here educated was Samuel Phillips, the originator of the similar academy at Andover, Mass., after which the later institution bearing the honored name of Phillips, at Exeter, N. H., was modelled; so that Dummer Academy may be regarded as in a certain sense the parent of both these others, though not incorporated till 1782, later than Phillips Academy of Andover. Gov. Dummer’s name is also perpetuated in Dummerstown, Vt., named for him, where he was the oldest proprietor, owning a. tract of land of 48,000 acres, which included the town. Fort Dummer in Vernon, the first settlement made in Vermont, in 1724, was also named after him. Gov. Dummer is the representative of the family whose use of the arms confirmed by the Earl Marshal of England to those of them who applied, in 1711, for a recognition of their right. The act of Herald’s College in 1711, by its very terms, was not an original grant of a coat of arms, but simply a recognition and confirmation of the prescriptive right and title which the applicants had to a certain coat from their ancestors; in which Gov. Dummer shared equally with the applicants. Although he did not join in the application, Gov. Dummer used the arms represented to the right. Again, the Herald’s College, by allowing to certain persons, in 1721, the use of Dummer arms only recognized and confirmed a right in which all descendants of the Dummer heiress who had carried her arms, by marriage, into another family, shared alike, although only two members of this family applied to have the right confirmed. 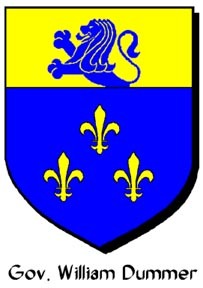 The arms are described as: "Azure, three fleurs de lis Or, on a chief of the second a demi-lion of the first." DUMMER, William, lieutenant – governor of Massachusetts, b. in Boston in 1677; d. there, 10 Oct, 1761. When Samuel Shute was appointed governor of the colony in 1716, Dummer was commissioned lieutenant – governor, and after Shute left, 1 Jan., 1723, he acted as governor and commander – in – chief till the arrival of Gov. Burnet in 1728. He conducted the war with the Indians with skill, and was respected for his ability and zealous regard for the public good. After the death of Gov. Burnet he was commander – in – chief again till the arrival of Belcher. After 1730 he lived in retirement. When he died he left his valuable farm and the mansion – house, which is still standing, to endow Dummer academy in Byfield parish, in the town of Newbury, the earliest academy in New England, which was opened on 27 Feb., 1763, with twenty – eight pupils. — His brother, Jeremiah, scholar, b. in Boston, Mass., about 1680; d. in Plaistow, England, 19 May, 1739, was graduated at Harvard in 1699, where he was noted for brilliancy. He studied theology, and afterward spent several years at the University of Utrecht, where he obtained his doctor’s degree. Soon after his return to America he was sent to England in 1710 as agent of Massachusetts, and remained in London in that capacity till 1721. He was a benefactor of Yale college, to which he presented 800 volumes. He was intimate with Bolingbroke, and adopted some of his views. He published theological and philosophical disquisitions in Latin while at Utrecht, and a “Defence of the New England Charters” (London, 1728; reprinted, 1765), in which he argued that the New England colonists held their charters by compact, in consideration for redeeming the wilderness and annexing it to the British dominions, and that their land – titles were not derived from the crown, which only possessed political rights over the country, but were based on purchases from the natives and on occupation and their own courage and enterprise. The proposal of the Board of trade to unite the colonies under a single viceroy and one assembly would produce, in his opinion, the result that it was chiefly intended to avert, that of encouraging the colonies to throw off their allegiance and constitute themselves a free state. Click to return to William Dummer on the Dummer Family Page. Click to visit the Sewell Genealogy Site Map. Click to contact Robert Sewell.